Australia’s leading food manufacturing specialist in integrated facility engineering, Wiley, has announced that it has been recognised at the Queensland Master Builders Association (QMBA) Brisbane Regional Awards with a QMBA award for Innovation in Environmental Management Construction. According to the media release, the company won the QMBA award for the development of the innovative biogas and waste water treatment construction for meat processing company JBS Australia. The project’s key solutions included: constructing a new 20ML Covered Anaerobic Lagoon (CAL); covering two existing Anaerobic Lagoons (AL) with high density polyethylene (HDPE) to capture biogas, and then burn the gas through the boiler to provide energy for the plant; installing a biogas train to pipe biogas from the CALs to a central flare and then to the existing 10MW boiler; and upgrading the Waste Water Treatment Plant (WWTP) with a new Dissolved Air Flotation (DAF) unit. “Whatever the structural development, some are so complex they need a fresh perspective on them to deliver a practical, effective, and in this case an innovative solution and that’s something Wiley prides itself on,” said Managing Director, Tom Wiley. 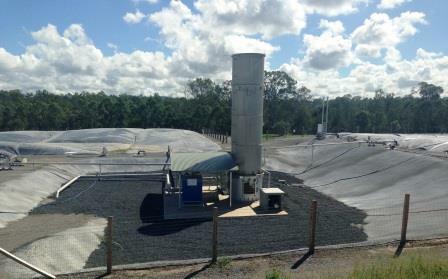 JBS Australia’s self-sustaining biogas facility captures cattle emissions to power an existing natural gas-fired boiler plant, resulting in an 89% reduction in the facility’s annual greenhouse gas emissions and savings of more than $1 million a year on natural gas costs. “This is an industry benchmark demonstrating the reality of environmental processing solutions for heavy emission producers. It is a great win for Wiley, JBS Australia and everyone involved,” said Wiley Project Director, Graham Harvey in his acceptance speech at the Awards. An in-depth profile of the JBS Dinmore project is available to read and download here.